Alex & Alexa are an internet fulfilment company who specialise in the supply of high quality children’s clothing & accessories. Alex & Alexa required their distribution centre to be refurbished to increase the capacity of the building & the number of pick face lines which was required for the growth of the business. HMF did a complete survey of their existing distribution centre & provided layouts for the proposed new storage equipment configuration. This plan included the relocation of some product lines including toys & accessories. The addition of new garment hanging rails enabled the safe storage of hanging clothing as an integral part of the storage equipment design. 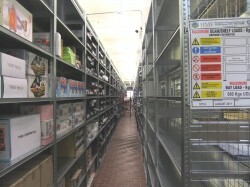 HMF specified Dexion Hi280 adjustable shelving. 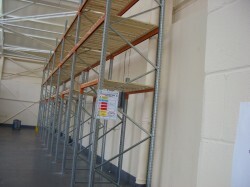 This shelving was 3m high & included mesh backs & sides to all exposed edges of the shelving. The mesh was fitted to ensure the product was safely stored & reduced the risk of any items falling out of the captive locations whilst still allowing good air flow & heat movement within the warehouse. The mesh also allowed natural daylight to permeate through the building. 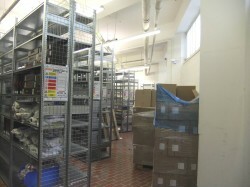 The finish of the shelving was pre-galvanised. .
HMF supplied over 1.5 miles of shelves with a loading of 85Kg per shelf level & a maximum bay load of 680Kg. The new distribution centre has an increase of over 100% of pick locations & capacity & has enhanced the filling efficiency of the stock located within a higher density arrangement plan than previously configured thereby reducing travel distances & picking times.